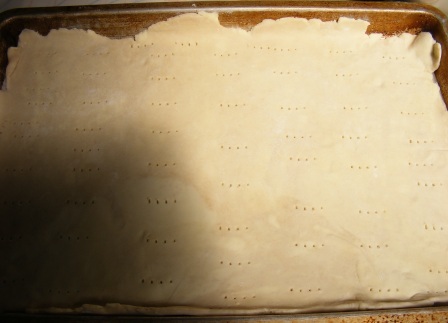 For the Puff Pastry section of the Modern Baker Challenge, I’ve decided to take a more organized approach to baking and posting the recipes. In previous sections, I made the recipes roughly in order (although not always) and wrote and published posts as I finished each recipe. As a result, I would often publish several recipes in a row over the course of a few days and would usually finish the section well before the end of the allotted time frame. At the beginning of the month, as we moved into the Puff Pastry section, I decided to institute “Modern Baker Mondays”. As the name implies, I’ll be posting the recipes on Mondays. I’m going to post one per week, in the order the recipes appear in the book, regardless of when and in what order I actually bake them. This week’s Modern Baker Mondays offering is the last in a series of sweet mille-feuille, which included chocolate-filled Napoleons and raspberry mille-feuille. 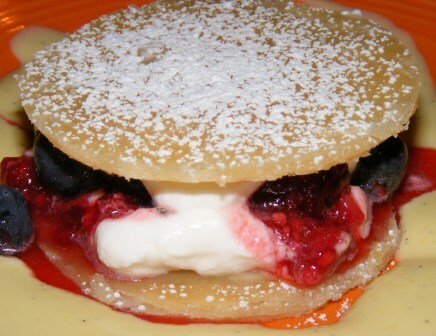 The feuillettés are similar to the raspberry mille-feuille, the main differences being size (the feuillettés are mini mille-feuille) and the use of crème anglaise instead of pastry cream. The feuillettés are comprised of four components — crème anglaise, macerated berries, whipped cream, and disks cut from a baked pastry layer. 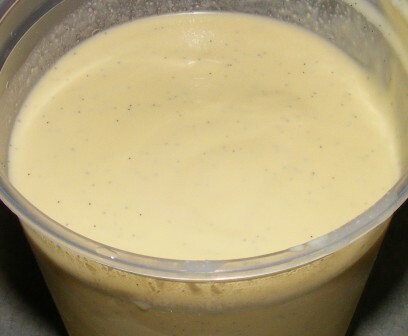 Making the crème anglaise is the most time-consuming part, but it’s not difficult. And it’s so good, you may find yourself making it again to use for other things, like berries and cream or crème anglaise ice cream. Once everything is prepared, it’s just a matter of putting the feuillettés together. This simply involves layering pastry disks, whipped cream, berries, and crème anglaise. So easy a child could do it. Really. We had fun putting these together, and even more fun eating them. This was a simple, stunning, and delicious dessert. It would make the perfect finish to a summer dinner party. 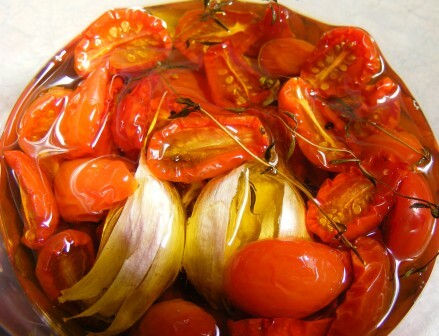 I meant to make this week’s French Fridays with Dorie recipe. I really did. I even took ground buffalo and sirloin out of the freezer and bought the hamburger buns. But something happened when I went to make the burgers. Yep, I made a meatloaf. 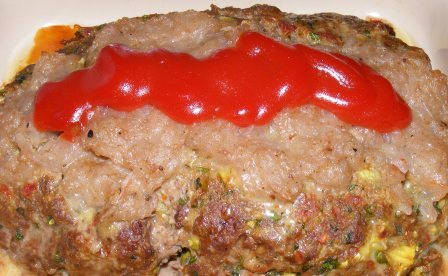 I’m not sure why; I was just in the mood for meatloaf. 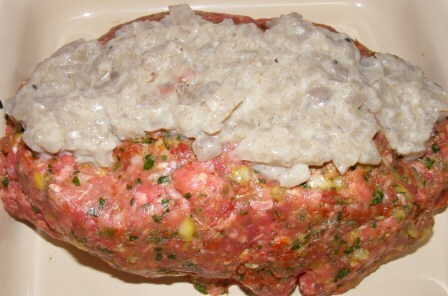 The filling, with its tomatoes, capers, pickles, and herbs, seemed like a great base for a meatloaf. And the onion marmalade was perfect on top. This was a great meatloaf. It held together well, and the flavor was outstanding. We enjoyed it for dinner the night it was made, and as sandwiches the next day. 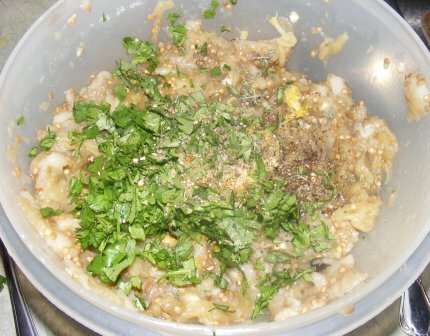 Sometime I might make this recipe it as hamburgers. But I will definitely make it again as meatloaf. 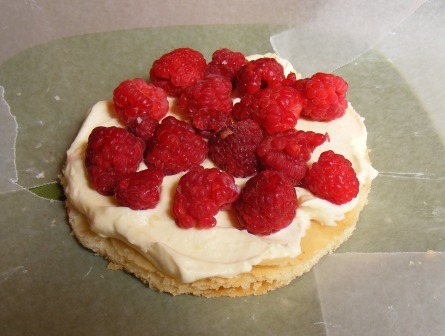 This week’s recipe for the Modern Baker Challenge is raspberry mille feuille, a light, creamy, custardy dessert. 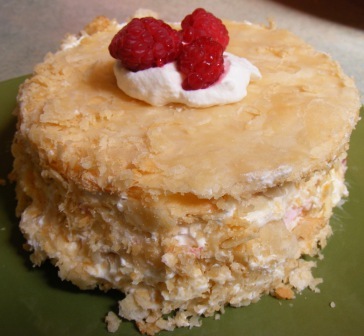 Mille feuille (pronounced “meel fwee”) is French for “thousand leaves”, a reference to the many-layered puff pastry that forms the base of this dessert. 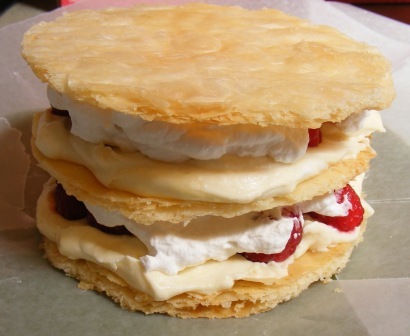 Like the Napoleons that I made recently, the mille feuille is made with a baked pastry layer. 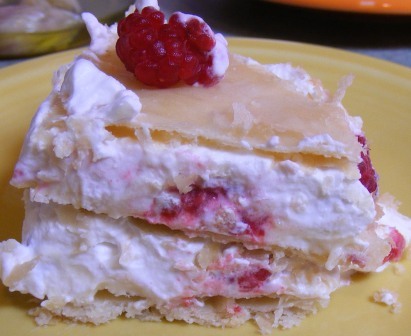 In this case, the filling is a vanilla custard layered with raspberries and whipped cream. In previous posts, I’ve mentioned my love for King Arthur’s pastry cream mix and noted that I generally use it whenever a recipe calls for pastry cream. 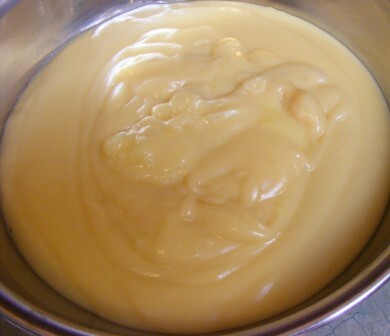 This time, however, I decided to follow Nick’s recipe and make my own pastry cream. The recipe called for milk, sugar, cornstarch, egg yolks, butter, and vanilla. 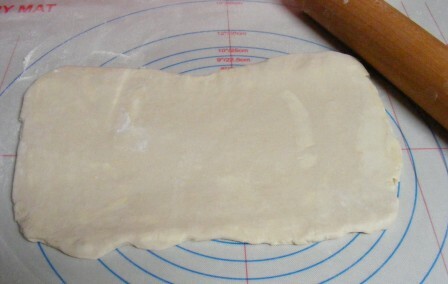 It came together quickly and made a delicious pastry cream. 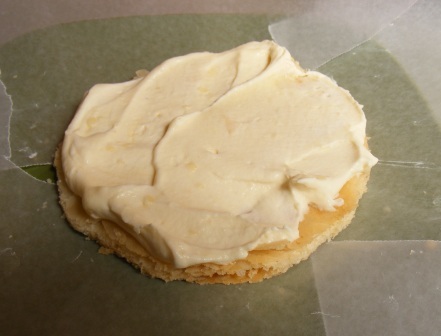 I covered the pastry cream and refrigerated it overnight. 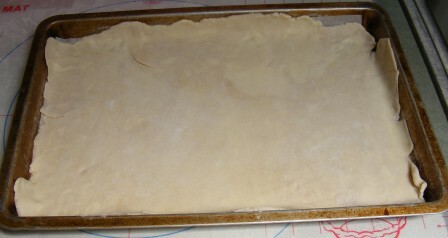 The next day, I baked and cooled a pastry layer, whipped some cream, and set about assembling the dessert. 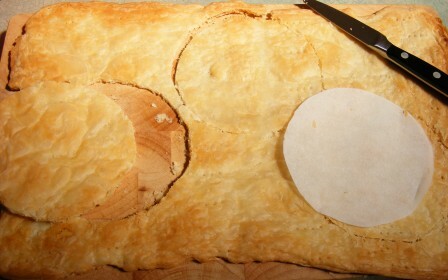 For the baked layers, I cut the puffed pastry into three circles. 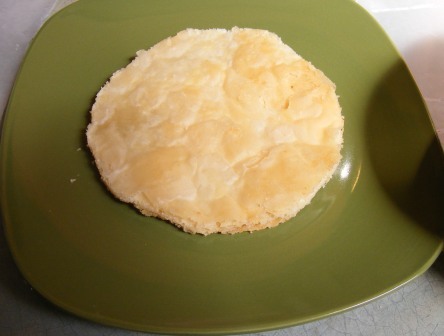 The recipe called for 9-inch disks, but I made mine smaller, as I was scaling the recipe down. 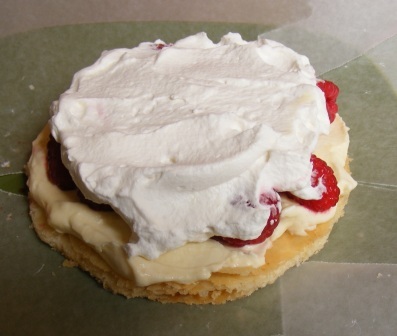 With my pastry circles, homemade whipped cream, raspberries, and pastry cream at the ready, assembling the mille feuille was a breeze. 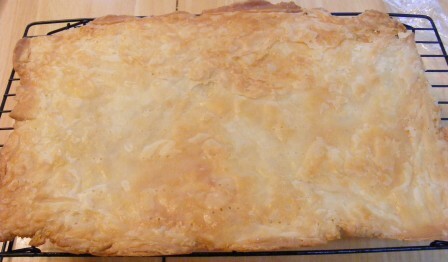 I began by putting a dollop of pastry cream on a plate. I covered the cream with a pastry disk. 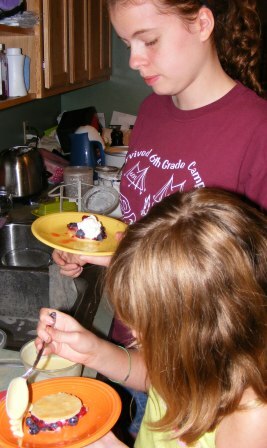 …then spread whipped cream over the berries. 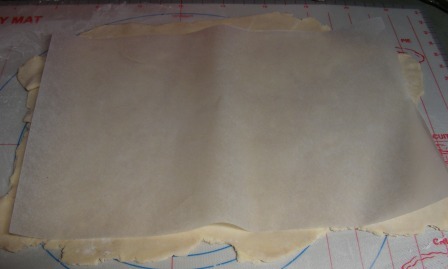 I repeated the layering and finished with the third baked pastry disk. 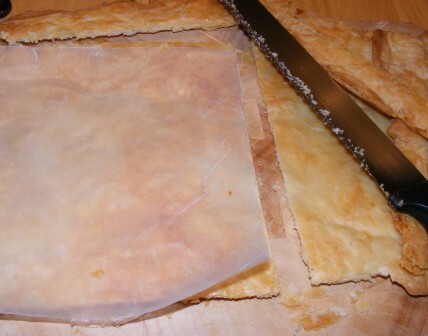 Then I compressed the mille feuille, smoothed the filling around the edges, and pressed crushed pieces of pastry dough around the outside. 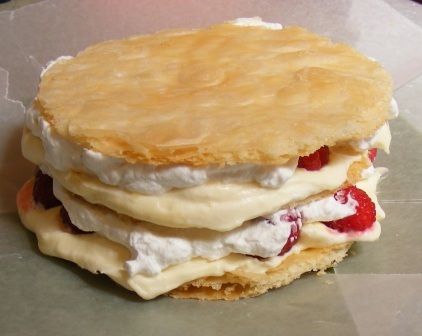 When I was ready to serve the mille feuille, I topped it with a bit of whipped cream and some raspberries. The scaled down version, for which I used half recipes each of the pastry cream and whipped cream, yielded six generous servings. We really enjoyed this dessert. My father-in-law, who happened to drop by while I was putting it together, raved about it. It was easy to assemble, and the results were both visually stunning and delicious. This was another over-the-top dessert from The Modern Baker that can make any home cook look like a professional pastry chef. If you don’t have this book on your cookbook shelf, you’re really missing out. This week’s recipe for French Fridays with Dorie was actually a repeat for me. 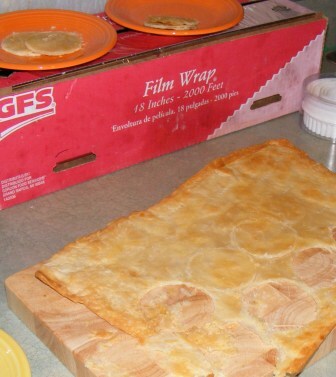 This was the first recipe I made from Around My French Table before French Fridays even started. 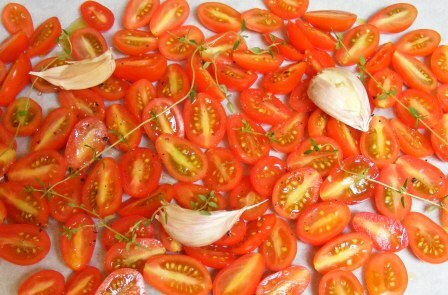 The only change I made this time was to add some slow-roasted tomatoes. 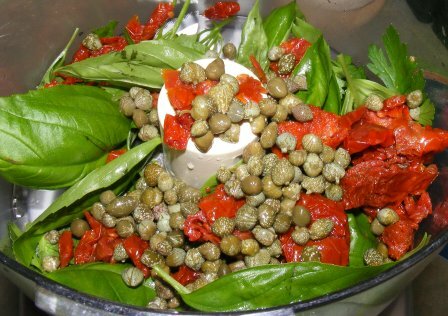 This is really a simple recipe (which, in case you’re wondering, has no caviar in it). The first step is to roast the eggplants. 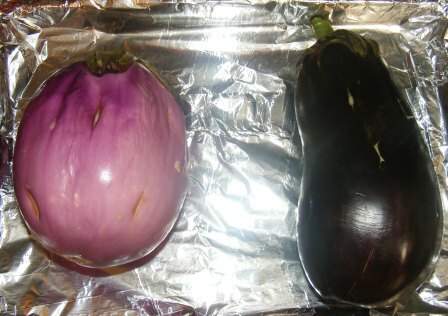 In a sidebar Dorie suggests slitting the eggplant and stuffing it with slivered garlic. I followed her suggestion, and the roasted garlic gave the eggplant great depth of flavor. 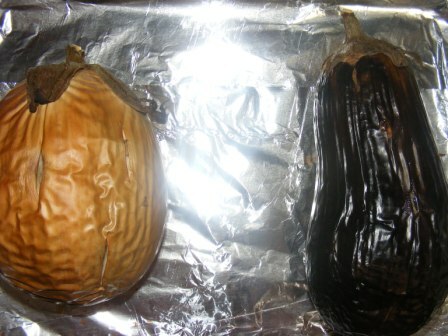 I baked the eggplants for 45 minutes, until they were soft and wrinkly. After the eggplant meat was sufficiently broken down, I added the remaining ingredients — lemon zest and juice, onion, basil, thyme, cilantro, cayenne, salt, and pepper [and the second time, roasted tomatoes marinated in olive oil]. The recipe doesn’t specify how much salt to add; I found that it needed quite a bit, about 2-3 teaspoons. I used black truffle salt, which gave the dish amazing flavor. I also added healthy amounts of black pepper and cayenne. 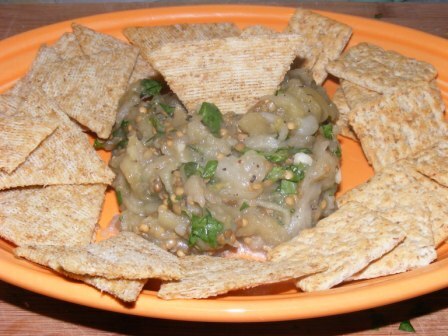 I was hooked on Dorie from the time I tried this recipe, and I went on to make about half a dozen others from AMFT before French Fridays started. 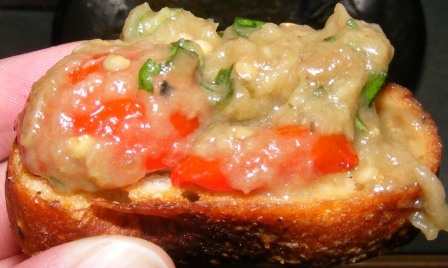 When this recipe came up for French Fridays, I actually forgot I had made it before. I’m glad, because had I remembered I might have passed on making it again; and this is definitely one worth repeating. This week’s recipe for the Modern Baker Challenge is one of several versions of mille feuille, which consist of a filling (usually sweet, but sometimes savory) between baked layers of puff pastry. 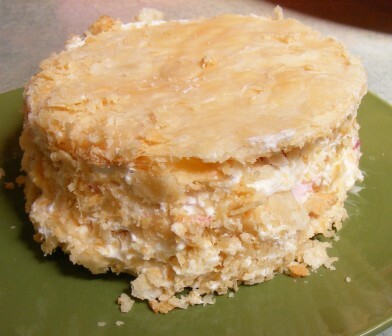 Mille feuille is French for “thousand leaves”, a reference to the delicate layers exhibited by the puff pastry when it is baked. 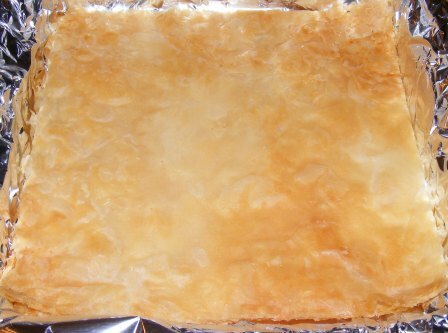 To make the Napoleons, I began by baking a pastry layer, which I then cut to fit a foil-lined pan. 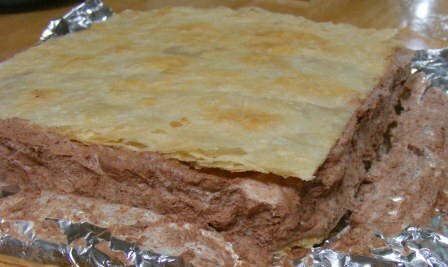 Next, I made a richly flavored chocolate mousse to go between the pastry layers. Most of the chocolate mousse recipes I’m familiar with are made fluffy by the addition of either whipped cream or egg white meringue to a chocolate pudding base. So I was surprised to see that Nick’s recipe utilizes both whipped cream and meringue. I had no doubt that this would make a stunning mousse. 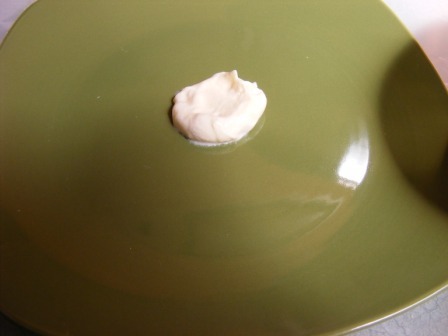 Another interesting twist to Nick’s recipe is a secret that I recently picked up from Dorie Greenspan‘s Around My French Table — the addition of unflavored gelatin to the mousse. As I learned when I made Dorie’s citrus-berry terrine, French chefs (both home and professional) see gelatin as just another pantry staple and use it for many things, including strengthening whipped cream and stabilizing mousse that’s destined to be used as a filling, as in this recipe. 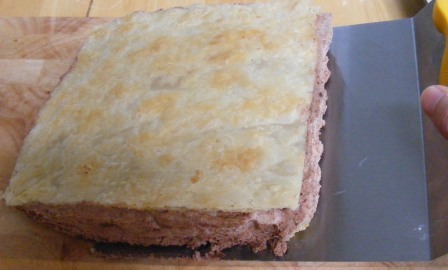 I spread the mousse over the baked pastry layer in the pan. Then I topped the mousse with a second pastry layer, compressed it gently, and chilled it in the fridge overnight. 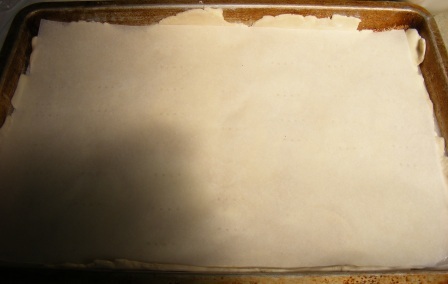 The next day, I removed the pan from the refrigerator and unmolded the pastry by lifting it out of the pan, peeling away the foil, then transferring the pastry to a cutting board with a large cake spatula. 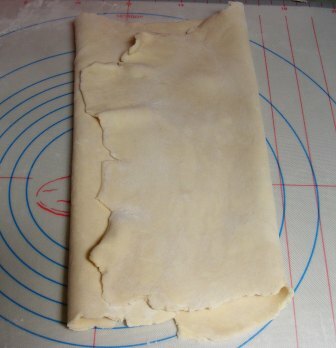 I trimmed the edges of the pastry, then cut it into serving-sized pieces. 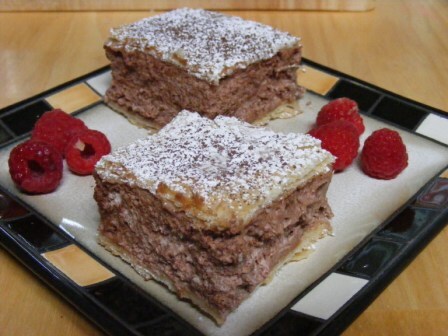 I dusted the Napoleons with powdered sugar and cocoa, then plated them with a few raspberries. My family is accustomed to my cooking and baking, which often includes exotic ingredients and fancy plating. But even they were impressed with these pastries, which we all agreed looked like they had come from a fancy bakery. And the taste? Well, let’s just say it lived up to the appearance. The mousse was rich and deeply flavored. And the pastry was crisp, buttery, and flaky. This is a dessert worthy of your best dinner party. It’s also perfect for a weeknight family supper. 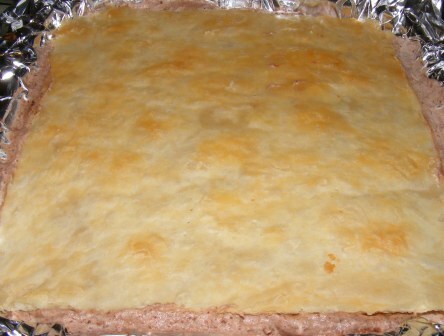 Margaret wrote the official post for this recipe. You can read about her experience here. I’ve had my eye on a doughnut pan for a while, and the other day at the outlet mall one somehow jumped into my bag. 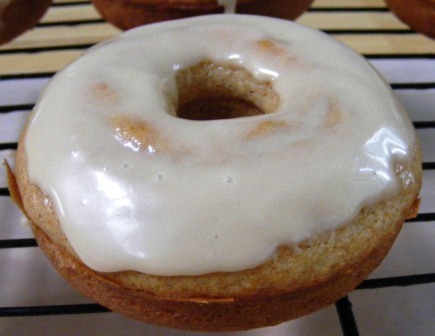 So for Sunday morning breakfast, we had delicious cider doughnuts with a cider glaze. This recipe is adapted from King Arthur Flour and uses their delicious boiled cider. It makes six doughnuts, just right for the pan, but could easily be doubled. Preheat oven to 400°F. 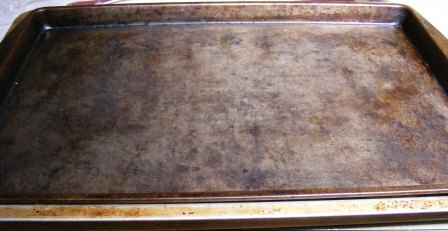 Lightly grease a six-cavity doughnut pan. Combine butter, oil, sugar, salt, cinnamon, and nutmeg in bowl of mixer. 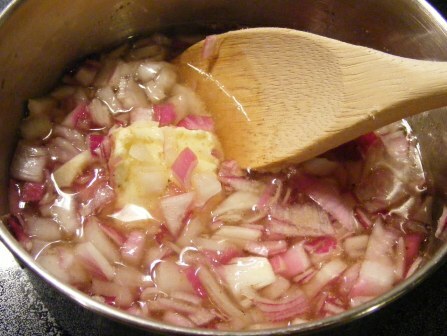 Beat until smooth, then add boiled cider and egg, beating well after each addition. Whisk together flour, baking powder, and baking soda in a small bowl. Alternate adding flour mixture and milk to mixing bowl, stirring well on low speed after each addition. 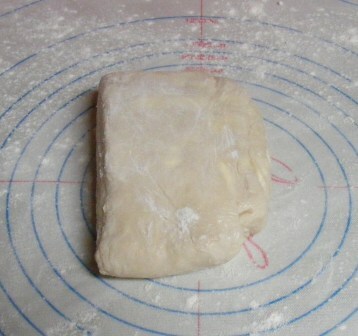 Add flour in three additions and milk in two, beginning and ending with flour. 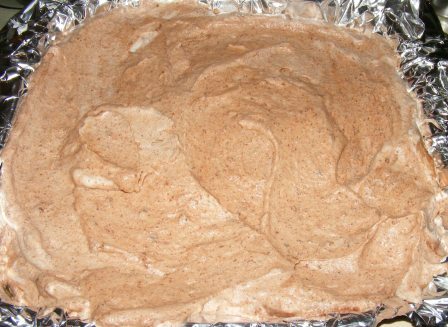 The batter will have the consistency of quick bread batter. Spoon batter into the pan and smooth the tops. 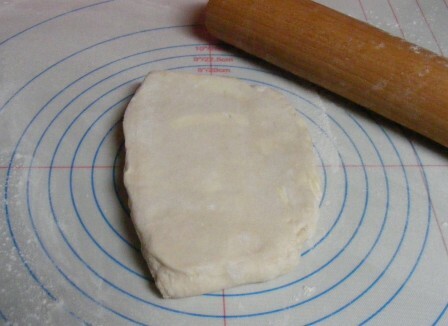 Bake for 10 to 12 minutes, until the doughnuts are baked through and a cake tester or toothpick inserted into the center of one comes out clean. Cool for 5 minutes in the pan, then turn out onto a rack to finish cooling. 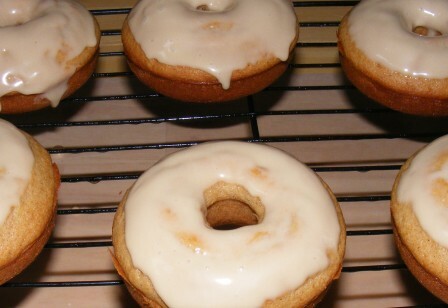 While the doughnuts are cooling, make the glaze. 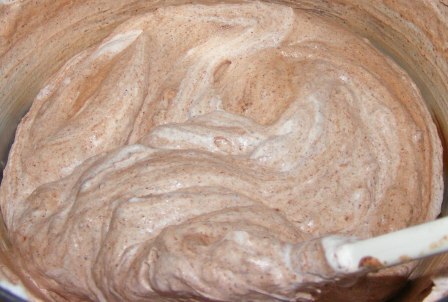 In a small, shallow bowl, mix 1/2 cup powdered sugar, 1 tablespoon boiled cider, and 2 teaspoons cream, milk, or water. Stir to mix and add additional cream or powdered sugar as needed so that the glaze has the consistency of molasses. Dip the tops of doughnuts in the glaze. If necessary, scrape away any excess glaze with a spatula. Place doughnuts on wire rack over waxed paper. Makes 6 doughnuts. Try not to eat them all yourself. 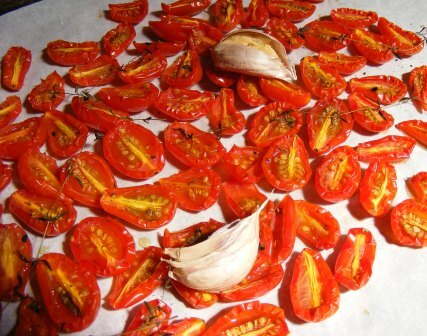 This week’s recipe for French Fridays with Dorie was, for me, a long time coming. Month after month, it appeared on the poll; and month after month, it got voted down. Finally, this month came around and, as fate would have it, there was no poll. Laurie (or fearless moderator) asked for suggestions for August recipes, and I jumped in with this one right away. 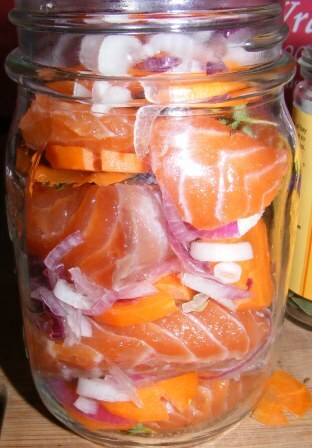 My persistence finally paid off, and this week we are — finally — featuring cold cured salmon in a jar! 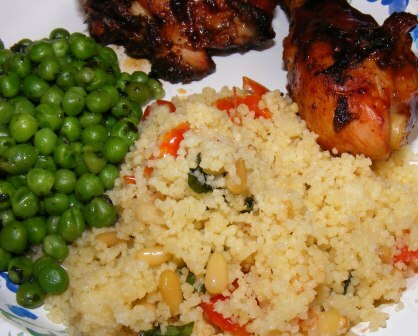 Even though it sounds kind of exotic, this is really a simple recipe. 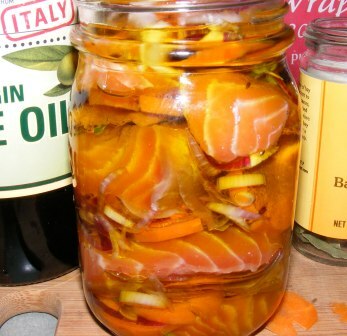 After curing salmon and boiling potatoes, you pack them in jars with herbs, spices, aromatics, and oil. 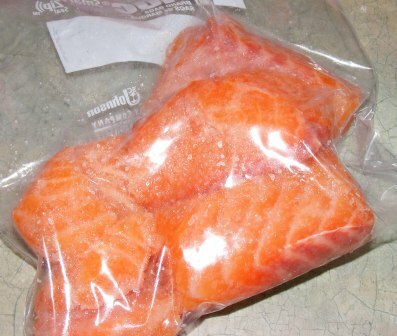 I began by tossing a few thick chunks of center cut salmon in salt and sugar, then packing them in a zipper seal bag and chilling them in the refrigerator for about 18 hours. The next day I boiled some new potatoes in salted water until they were knife tender, then drained and sliced them. 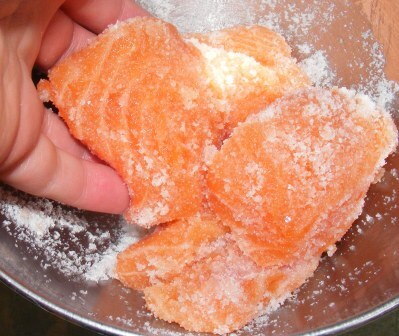 I rinsed the brine from the salmon and patted the pieces dry with paper towel. 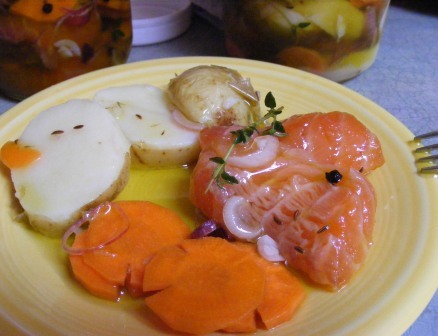 I packed the salmon and potatoes in separate jars, layering them with coriander seeds, peppercorns, bay leaves, thyme, carrots, onion and, in the case of the potatoes, a little salt. I filled both jars with olive oil, then topped the potatoes with a splash of vinegar. 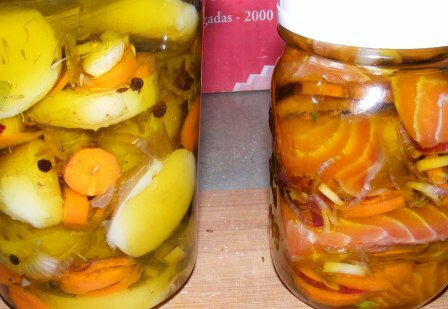 I refrigerated the jars overnight, then served the salmon, potatoes, and vegetables for lunch the next day. This was a delicious and surprisingly light lunch. The salmon and potatoes both picked up a lot of flavor from the herbs and spices without becoming overly oily. 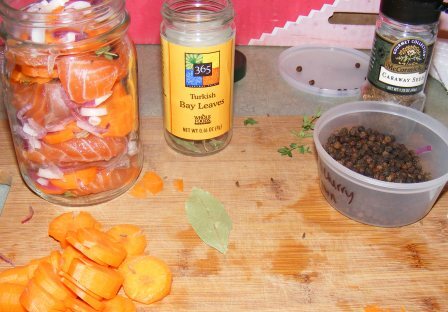 As the only one in my family to eat salmon, I enjoyed several lunches from this recipe. I was really looking forward to trying this recipe, and it didn’t disappoint. Now I just need to find some adventurous friends to share it with! 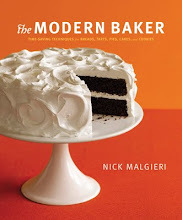 A group of us are taking turns picking recipes from Nick Malgieri’s most recent book, Bake! My friend Kayte came up with the idea, and we’ve grown to a small but dedicated group of about half-a-dozen bakers. My most recent pick coincided with my birthday, so of course I was going to choose cake. 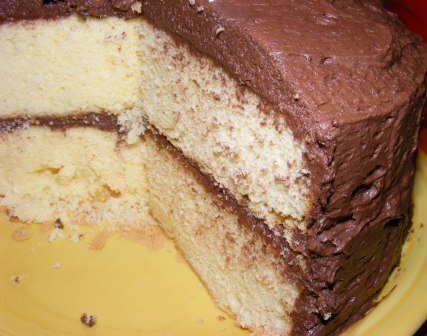 And since my favorite cake is yellow cake with chocolate frosting, the choice was easy. I actually chose two recipes: golden sour cream layers (p. 125) and perfect meringue buttercream, in the baker’s choice of vanilla or chocolate (p. 156). The kids were out of town on a visit to my parents’ house the weekend before my birthday, so I made the cake layers and double wrapped them in plastic wrap, planning to make the buttercream frosting the evening before or day of my birthday. A number of the other bakers reported issues with the meringue frosting, especially when adding chocolate, so I was anxious to see how it would work out for me. As it turned out, my mom had planned to bake me a cake while she was here, so she went ahead and frosted the cake layers using her tried-and-true frosting recipe. I’ll try the frosting later, but the cake was delicious. The layers were a tad dry, but that may have been because I made them a few days ahead of time. In any case, the flavor was great, and I’ll make this cake again. If you’d like to bake along with us, pick up a copy of Bake! and drop Kayte or me a line. We’re “rewinding” for the month of August, which means we’re not adding new recipes, and we’re using the month to catch up on recipes or posts we may have missed. Check out our Facebook page for the recipe lineup beginning in September. In the meantime, check out what Kayte, Abby, and Margaret thought about this cake.